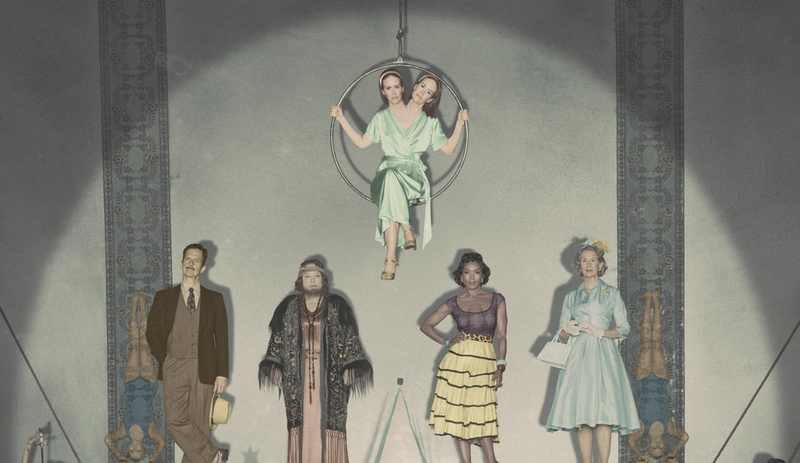 With television show trailers becoming as hotly anticipated as their big screen counterparts, the American Horror Story: Freak Show trailer did not disappoint. Glee bosses Brad Falchuk and Ryan Murphy are serving up yet another spooky edition of their cult horror series just in time for the season of scares, and the song from the new AHS: Freak Show trailer has got me reeling. Teaser trailers have been abundant in recent weeks, teasing this season's stable of sideshow folks who make up one of the last freak shows, but it wasn't until fans were treated to the extended trailer that the creep factor really got real. We finally got to see AHS super alum Jessica Lange in all of her moving glory as Elsa Mars, manager of the show, alongside other characters such as Coven's Kathy Bates as bearded lady Effil Darling. But what really sells the mood of the trailers isn't just the stunning visuals or getting to see the characters populate their world. It's the trailer's expertly selected soundtrack, namely The Voice's Melanie Martinez whose song "Carousel" sounds as if it were written with the show in mind. The song hails from her EP Dollhouse, and viewers of The Voice know Martinez can carry a sultry, creepy tune. The song starts with a circus squeezebox sound that smoothly transitions into a moody modern beat. Then we get to the lyrics, and you think the AHS creators must have squealed with glee (see what I did there?) at finding something so perfect. Right before the chorus, Martinez croons the familiar call: "Come one, come all/ You must be this tall/to ride this ride at the carnival." What follows is a story of heartbreak and loss told through being trapped at a carnival. Cotton candy hearts are broken, and throughout the tune, the protagonist of the song is stuck on a carousel horse, unable to stop spinning around and around. And of course the kicker: she name checks the words "freak show" more than once. Right, right when I’m near,it’s like you disappeared,where’d you go? My dear, you're a freak show! Lyrically and sonically, the song sets a tone in line with what we already know about Freak Show. From the show's description so far, I would posit we'll find characters struggling to find their humanity but not able to actually leave their carnival "home" (or discovering that whatever is outside is scarier.) Martinez's track paints a picture of losing something but not being able to escape, inspiring theories that perhaps the real evil this season will be figuring out if the freak show is a haven or a curse. It's no easy task picking music for what is essentially fans' first extended look at the latest installment of a beloved series. But Martinez was clearly the gal for the job. The title single from her album, "Dollhouse" features a similar spooky instrumentation with the singer dressed as a dead eyed doll to boot paired with sinister lyrics that beg the listener to dig deeper than the surface and expose a terrifying reality of broken family life. As an artist, Martinez is very adept at conveying the horror of human relationships and pinpointing the more macabre elements in our day-to-day existence. Listening to her other tracks, it's clear that Martinez could score a whole season's worth of AHS; her specialty is showcasing the human carnival in all its terror.